The boyfriend came up with that snappy title when we were planning outfits for a dinner in Los Angeles. My outfit called for a pocket square, but I couldn’t decide which one. When I asked the boyfriend his opinion, he came up with that fine piece of sage advice. Words to live by, my friends. I really love all the dots in this outfit. Between the sweater, pocket square, necklace, and pearl bracelets, it all just goes. The boyfriend was on a mini stay-cation to recharge for a few days, so what did I do? Coerce him into being my personal photographer of course! Didn’t he do a great job?! He did do a great job, the photos look great! 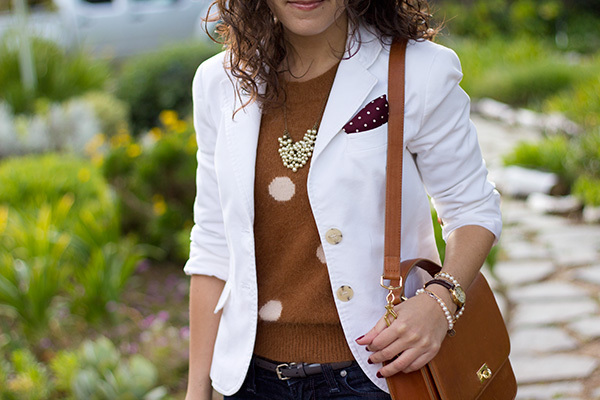 I love the combo of the brown polka dot sweater with the white blazer. I love the title, so clever and true :) And Clinton is such a cutie! I am loving all these kerchiefs that you’ve been sporting lately! love it! I love the polka dot sweater and the pocket square Kelly! 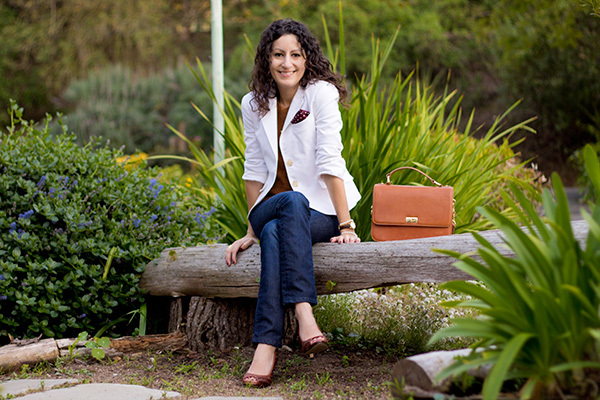 The delicate pearl necklace from J.Crew is also fab…and I’m also loving the pretty background! Awww…..Clinton! He’s gotten so big :) Your boyfriend really did do a great job with these pictures and you always have the prettiest backgrounds! He did a great job! And love the outfits. My hubby has an aversion to polka dots so I don’t wear them. Plus, it makes me look childish but something about your outfit is very sophisticated. Must be the crisp blazer! Adorable photos! Your personal photographer definitely has a good eye for it. Love the dots! Mr. AN is good with the camera! You look very relaxed here guess coz of the special man behind the camera and you didnt have to worry about settings and stuff ;-) Love the white blazer! Hello! 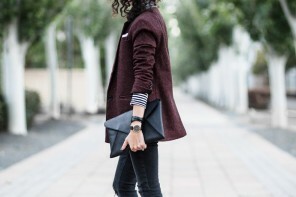 Would you recommend scrunching of blazer sleeves for petites? I recently bought this nice blazer but its sleeves are quite longer than I want them to be. Adorable dog! Love the photos. Your BF did a great job. Must be Spring with all the blooms in the background! I have been contemplating on getting the Edie :) Looks good! I just caught up on your blog…loved your MadMen post! That sounds like a fun night…your man with you for the first time and meeting other ladies from blogs! I do agree with @Helen, your boyfriend he did a great job. 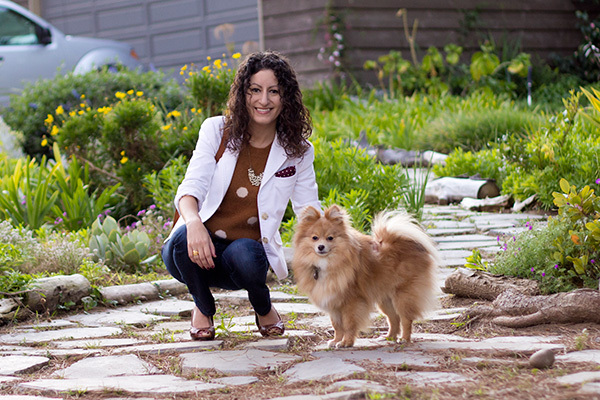 The background is absolutely beautiful, and your dog is soooo cute!